This module provides a brief overview of Buoyancy and CAPE. Topics covered include the origin of atmospheric buoyancy, estimating buoyancy using the CAPE and Lifted Index, factors that affect buoyancy including entrainment of mid-level air, water loading, convective inhibition, and the origin of convective downdrafts. This module delivers instruction with audio narration, rich graphics, and a companion print version. This module provides a basic understanding of how to plot and interpret hodographs, with application to convective environments. 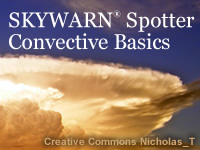 Most of the material previously appeared in the CD module, Anticipating Convective Storm Structure and Evolution, developed with Dr. Morris Weisman. Principles of Convection II: Using Hodographs includes a concise summary for quick reference and a final exam to test your knowledge. The module comes with audio narration, rich graphics, and a companion print version. Mesoscale convective systems occur worldwide and year-round and are accompanied by the potential for severe weather and flooding. 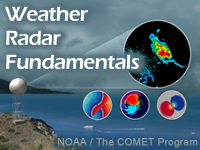 This module describes typical system evolution by examining squall line, bow echo, and MCC characteristics throughout their life cycles. This module has less emphasis on the physical processes controlling MCS structure and evolution than our previously released module, Mesoscale Convective Systems: Squall Lines and Bow Echoes. Instead, this newly updated module includes more material on tropical squall lines, MCC's, and on NWP’s ability to predict convective systems. The module starts with a forecast scenario and concludes with a final exam. Rich graphics, audio narration, and frequent interactions enhance the learning experience. This resource is intended for use as a job aid by operational weather forecasters in live warning situations and as a reference tool to better understand some aspects of severe thunderstorm warning events. Thumbnail images show typical representatives for sixteen radar reflectivity and velocity signatures as well as three primary severe storm types. 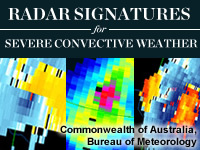 Each signature links to content describing detection techniques and conceptual and diagnostic information to help determine storm severity. The majority of the examples shown are southern hemisphere storms in Australia; examples from the northern hemisphere are noted. 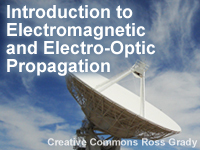 This lesson describes the properties of electromagnetic and electro-optical radiation and how their propagation is affected by the atmosphere and weather. Atmospheric variables that affect EM propagation include temperature, moisture, pressure, and composition. These variables control processes including refraction, absorption, and scattering. 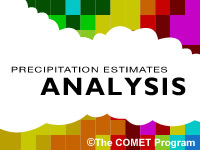 This is part two of a two-module series on estimation of observed precipitation. Through the use of rich illustrations, animations, and interactions, this module provides an introduction to the science behind successful application of the products and tools available through the NWS Multisensor Precipitation Estimator (MPE) software and related products. An overview is presented of the key fields available in MPE along with illustrations of their use. These include radar, gauge, satellite, bias-adjusted radar, and multisensor fields of precipitation accumulation along with data displays and tables used for evaluating and editing the data. Subsequently, methods for additional data editing with MPE's polygon editing tool are explained, as well as the selection of a best estimate. Finally, a case study section is offered to show how these methods have been applied in the field for a variety of events and locations.